Few things will protect your horse from the ravages of disease as easily and effectively as immunizations. 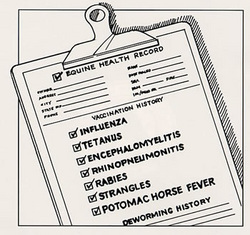 The vaccinations administered by your veterinarian to your horse place a protective barrier between the animal and a whole list of problems: tetanus, encephalomyelitis(sleeping sickness), influenza, rhinopneumonitis,rabies, strangles, and Potomac Horse Fever, to name the most common. A good immunization program is essential to responsible horse ownership, but just as in humans, vaccination does not guarantee 100% protection. In some situations, immunization may decrease the severity of disease but not prevent it completely. This is due to many complicated scientific reasons, such as differences in the virulence or severity of some diseases (such as influenza). Vaccination involves the injection (with a sterile syringe and needle) of bacteria or viruses that are inactivated or modified to avoid causing actual disease in the horse. Two or more doses are usually needed to initiate an adequate immune response. Once the immunization procedure is completed, the protective antibodies in the blood stand guard against the invasion of specific diseases. Over time, however, these antibodies gradually decline. The specific immunizations needed by a particular horse or horses depend upon several factors: environment, age, use, exposure risk, value, geographic location, and general management. Your local equine veterinary practitioner can help you determine the vaccination program best suited to your horse’s individual needs. The following diseases are those most often vaccinated against. Again, your local practitioner will know what is best for your horse. Sometimes called “lockjaw,” tetanus is caused by toxin-producing bacteria present in the intestinal tract of many animals and found in abundance in the soil where horses live. Its spores can exist for years. The spores enter the body through wounds, lacerations, or the umbilicus of newborn foals. Therefore, although not contagious from horse to horse, tetanus poses a constant threat to horses and humans alike. Symptoms include muscle stiffness and rigidity, flared nostrils, hypersensitivity, and the legs stiffly held in a sawhorse stance. As the disease progresses, muscles in the jaw and face stiffen, preventing the animal from eating or drinking. More than 80 percent of affected horses die. All horses should be immunized annually against tetanus. Additional boosters for mares and foals may be recommended by your veterinarian. Available vaccines are inexpensive, safe, and provide good protection. More commonly known as sleeping sickness,” this disease is caused by the Western Equine Encephalomyelitis (WEE) virus or the Eastern version (EEE). WEE has been noted throughout North America, while EEE appears only in the east and southeast. VEE, the Venezuelan variety, has not been seen in the United States for many years. However, a recent outbreak of VEE occurred in Mexico. Sleeping sickness is most often transmitted by mosquitoes, after the insects have acquired the virus from birds and rodents. Humans also are susceptible when bitten by an infected mosquito, but direct horse-to- horse or horse-to-human transmission is very rare. Symptoms vary widely, but all result from the degeneration of the brain. Early signs include fever, depression, and appetite loss. Later, a horse might stagger when it walks, and paralysis develops in later stages. About 50 percent of horses infected with WEE die, and the death rate is 70 to 90 percent of animals infected with EEE or VEE. All horses need an EEE and WEE vaccine at least annually. Pregnant mares and foals may require additional vaccinations. The best time to vaccinate is spring, before the mosquitoes become active. In the South and West, some veterinarians choose to add a booster shot in the fall to ensure extra protection all year-round. time” and indirect financial loss, not to mention discomfort for your horse. Unfortunately, influenza viruses constantly change in an effort to bypass the horse’s immune defense. Therefore, duration of protection is short-lived and revaccination is recommended every two to four months. Not all horses need influenza vaccination. However, animals that travel or are exposed to other horses should be regularly immunized against influenza. Follow your veterinarian’s advice as to whether your horse needs influenza vaccine. Two distinct viruses, equine herpesvirus type 1 (EHV-1) and equine herpesvirus type 4 (EJ-IV-4), cause two different diseases, both of which are known as rhinopneu-monitis. Both cause respiratory tract problems, and EHV-1 may also cause abortion, foal death, and paralysis. Infected horses may be feverish and lethargic, and may lose appetite and experience nasal discharge and a cough. Young horses suffer most from respiratory tract infections and may develop pneumonia secondary to EHV-1. Rhinopneumonitis is spread by aerosol and by direct contact with secretions, utensils, or drinking water. Virus may be present but inapparent in carrier animals. • Strangles. A highly contagious and dangerous disease. There may be some side effects associated with vaccination; therefore, it is important to discuss the risks versus benefits of vaccination with your veterinarian. • Rabies. A frightening disease which is more common in some areas than others. Horses are infected infrequently, but death always occurs. Rabies can be transmitted from horses to humans. • Botulism. Known as “shaker foal syndrome” in young horses, this disease can be serious. Botulism in adult horses, “forage poisoning,” also can be fatal. Vaccines are not available for all types of botulism, but pregnant mares can be vaccinated in endemic areas. • Equine viral arteritis (EVA). A complicated disease which can result in some breeding restrictions and export problems. Follow your veterinarian’s recommendations. • Tetanus. All horses. Foals at 2-4 months. Annually thereafter. Brood mares at 4-6 weeks before foaling. • Encephalomyelitis. All horses. Foals at 2-4 months. Annually in spring thereafter. Brood mares at 4-6 weeks before foaling. • Influenza. Most horses. Foals at 3-6 months, then every 3 months. Traveling horses every 3 months. Brood mares biannually, plus booster 4-6 weeks pre-foaling. • Rhinopneumonitis. Foals at 2-4 months and younger horses in training. Repeat at 2- to 3-month intervals. All brood mares at least during 5th, 7th, and 9th months of gestation. • Rabies. Foals at 2-4 months. Annually thereafter. • Strangles. Foals at 8-12 weeks. Biannually for high-risk horses. Brood mares biannually with one dose 4-6 weeks pre-foaling. biannually with one dose at 4-6 weeks pre-foaling. Many combination vaccinations are available. Please check with your local equine practitioner.